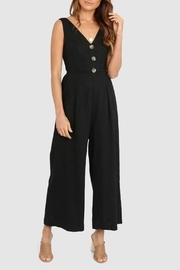 A sleeveless jumpsuit featuring a v-neckline, button-up front, cinched tie waist, back patch pockets, and front slant pockets. 93% Rayon 7% Polyester Color: Raven CARE Hand wash cold, wash with like colors, do not bleach, hang to dry, warm iron if needed or dry clean. FIT Relaxed Fit. Model is wearing Size S SPECS Bust: 36" Waist: 35.5" Inseam: 23.25"